The small town of Okanogan and the footprints from my grandpa have taught me some of the most valuable life lessons. The charming, pink house. The simplicity of walking down the street. The warmth of the smiles. The love that radiates from house to house, neighbor to neighbor. Born in 1920, my grandpa grew up in this charming, pink house. His heart belonged to the small town and to the 1,519 other people who also found a home in it. He went to school, then to his job, and returned home for dinner with his family. It was a simple lifestyle that we don't see as much of anymore. In past summers, my family and I would travel to Okanogan to spend time with my grandparents. It was a time filled with limited wifi connection, one bathroom for seven people, and grandma's secret meatball recipe. It was an escape from reality and an opportunity to be fully present with my family. My grandpa passed away in 2011. It was hard visiting Okanogan without him, especially for my grandma. My grandma and grandpa had a great love story full of faith, patience, and humility. Even though the town was different, his legacy and love still remained in that charming, pink house. The small town of Okanogan and the footprints from my grandpa have taught me some of the most valuable life lessons. 1. Find joy in the simple things. Though it seems simple, this can be hard to do. It's easy to get caught up in the world around you. School. Work. Social Media. Friends. But once you put your phone down, turn the television off, and look around, you'll start to notice that joy hides in the most unexpected places. Like in my grandma's garden. There's nothing better than a good PB&J sandwich to go along with my favorite Nicholas Sparks book. Or in the park. With my favorite pair of swingsets and an open field to play soccer, my sisters and I will stay here for hours. We live in such a high-speed world. It seems to pass us by before we can really appreciate it. That's why I love Okanogan. I can appreciate going to bed with the doors unlocked and feeling safe. I can appreciate my grandma singing me to bed. I can appreciate waking up to the sound of laughter and smell of bacon coming from the kitchen. I can appreciate it all. Sometimes we forget how much our family means to us. This small town constantly reminds me just how important family is to me. From walking the halls of my grandpa's high school to staying in the house he grew up in, my family and I can still see his footprints. And for this, I am forever grateful for Okanogan, Washington. So, I encourage you to find joy, slow down, and hold on tight to the ones you love. 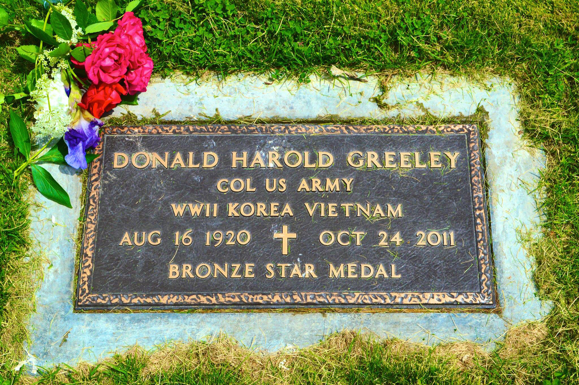 In loving memory of Donald H. Greeley: my grandpa and my hero.